Dîner en Blanc - International - Le Dîner en Blanc - Adelaide celebrates its 5th anniversary! Le Dîner en Blanc - Adelaide celebrates its 5th anniversary! 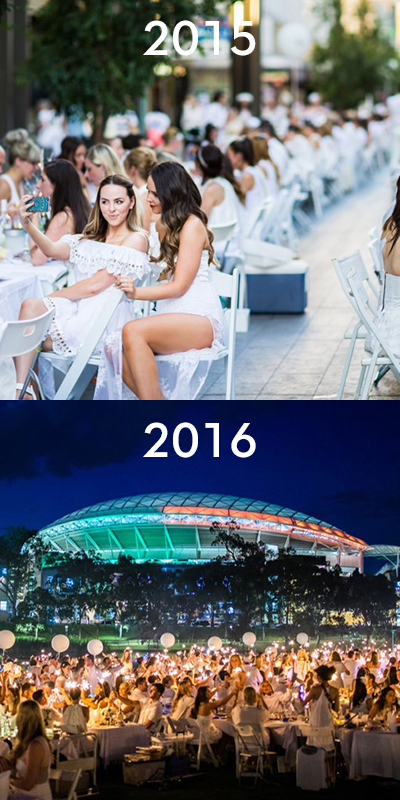 The love story between Le Dîner en Blanc and Australia is not a new one. Brisbane and Sydney were first to be enamoured by the Parisian concept in 2012 when the global phenomenon took flight. Soon after, other cities took the plunge by joining the ever-growing Le Dîner en Blanc international family: Adelaide, Melbourne, Canberra and Perth. This year, three new cities in Australia have joined the adventure: Darwin, Gold Coast, and Fraser Coast. 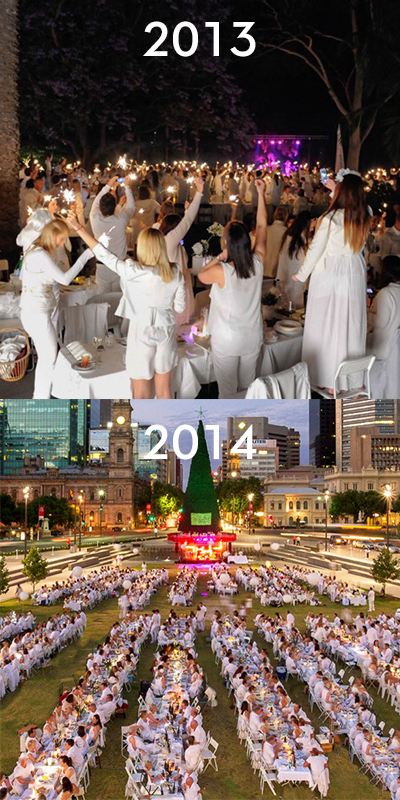 On Saturday, November 25th, Le Dîner en Blanc - Adelaide will celebrate its 5th anniversary! 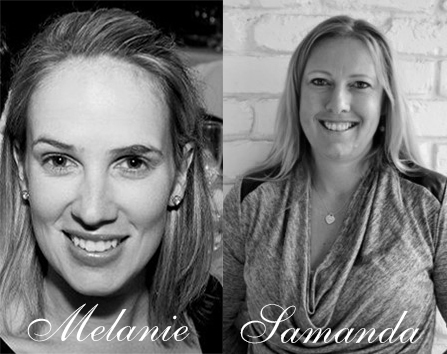 To mark the occasion, we want to take the time to pay tribute to our two hard-working hosts: Melanie Moffatt and Samanda Smith who would enjoy very much to experience the magic of Le Dîner en Blanc as a guest in Paris, Montreal and New York. Melanie and Samanda are definitely producing unforgettable nights for their guests because year after year, they enchant more and more friends! The first edition of Le Dîner en Blanc - Adelaide took place in the Adelaide Zoo where more than 750 friends gathered. The following year, with the previous success in hands, Melanie and Samanda welcomed more than 900 guests at the Victoria Square which at that time of year was already in a festive ambiance with a large Christmas Tree. In 2015, 1,400 people dined under the stars on the pedestrian area of Rundle Mall, a popular shopping and tourist area. Last year, 1,500 guests celebrated friendship and elegance “à la française” at the Elder Park known for its Rotunda built in 1882. This growing number of Le Dîner en Blanc participants is a sure sign of a great organization and also suggests that our two wonderful hosts can count on a loyal team of volunteers who are as enthusiastic and passionate as they are. The dream of Melanie and Samanda is to succeed in gathering 2,000 friends! Wouldn’t it be great if it came true for this 5th anniversary? If you want to help them in realizing their dream, register now on the waiting list at adelaide.dinerenblanc.com/register. Wishing Hosts, Volunteers and Guests a magnificent 5th anniversary!